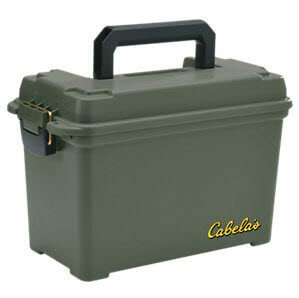 The Cabela’s Dry-Storage Ammo Can provides a safe, dry environment to store ammunition or other hunting gear with confidence. Our Dry-Storage Ammo Can is made of heavy-duty, molded plastic, and the lid uses a no-fail brass latch and a rubber seal to lock out moisture. The handle folds flat and the can’s design allows you to stack cans in storage. 767 cubic inch capacity. 15.75″L x 8″W x 10″H. Made in USA.